Garni Lenzenhof is located in the centre of Partschins, near Merano. It’s a pleasant Hotel Garni immersed in a landscape characterised by wonderful orchards and surrounded by the spectacular summits of South Tyrol, with absolutely stunning panoramic views. In addition to a warm welcome, here you’ll find tastefully decorated rooms and apartments which create the perfect atmosphere for a relaxing holiday in Merano and vicinity. After a peaceful night, you’ll be nourished by our hearty breakfast of various homemade foods and regional specialties, giving you the energy to face a full day of adventure. In nice weather, Garni Lenzenhof is the ideal starting point for walks and hikes in the surrounding areas as well as for numerous other leisure and outdoor activities. 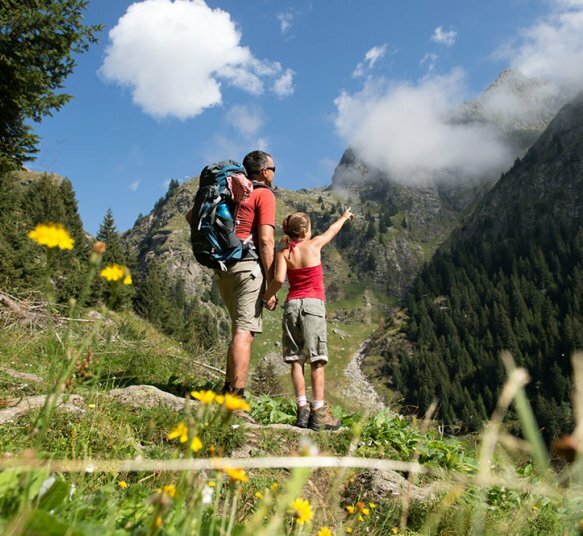 Discover the rich and multi-faceted land of South Tyrol through hikes that will put you in close touch with nature. Free your mind and body from the stress of the daily routine by engaging in various outdoor activities while breathing in the fresh mountain air. Children will love this holiday full of adventure: you’ll spend unforgettable moments with your family. Get to know the culture and traditions of our land and savour the typical specialties of the cuisine of South Tyrol. Take advantage of the free bus and train service throughout South Tyrol with the Merano Card, which you will receive at no cost upon your arrival at Garni Lenzenhof. The webcam on the roof of Garni Lenzenhof gives you a real-time panoramic view of Partschins and its surroundings. Flower meadows in the spring, lukewarm evenings in the summer or colorful leaves in autumn - experience the magic of South Tyrol! We are looking forward to welcoming you in our Garni from March to November . Free bus and train travel throughout South Tyrol and numerous discounts.